She needs to be dealt with, this shouting, stressed out mummy. I need to relax. Pondering behind my laptop I know what I need. A week at a spa, with yoga, massage and steamrooms. Me, enveloped in a chocolate-lavender wrap, listening to soothing muzak, nibbling on celery stalks and sushi. And daddy at home with the kids. That will add to my relaxation, revelling in the idea of him struggling, handling a toddler, a pre-schooler and a baby on his own. With two loads of laundry a day, three healthy meals, and a house where you can put one foot in front of the other without stumbling. I picture it, blissfully, until the bubble pops with a bang. He’ll laugh, say it will take the new and relaxed me five minutes at home to be her old angry self. And he is right, off course. I need a better plan. I think again, and if a personal masseuse won’t be an option either, what will? Pills, no. Homeopathy, I don’t know. Herbal concoctions, those I like. Herbs contain enough molecules to satisfy my scientific brain and enough magic to warm my heart. I sigh with relief. Finally, a plan. And how useful I named my children after herbs. 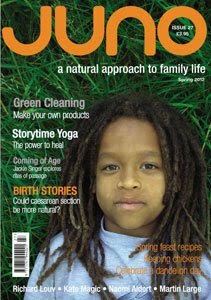 You'll have to purchase Juno magazine's new spring's issue, which features above story on mama tea, by your's truly. There are loads of other interesting articles to be read, so hop on to their website and see how you can get your copy.